"What a hot day!" Margarita, who is driving us from Ushuaia to the Estancia Harberton, takes off her red fleece sweater. Summer is short in the southernmost city of the world, and days like this, with temperatures soaring above 20 °C, are rare. "These are the expedition ships going to Antarctica," Margarita points to the harbour. 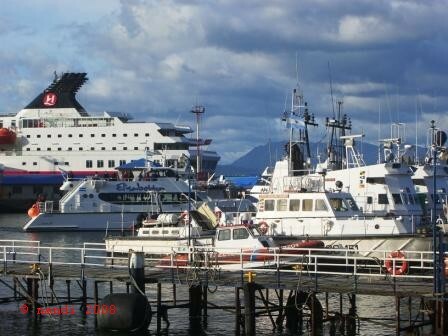 Ushuaia is the base for most Antarctic cruises, and last-minute deals start from 4000 US$ for 11 days. From here it is only about 1000 km to the Antarctic peninsula, and many of the islands around Ushuaia are populated by penguins and sea lions. On our way out of the town, we first pass through the industrial zone: a lot of electronics and petrochemical industry. "It’s an important port of transshipment." From under her seat, Margarita pulls out a box with plastic granulate "This is produced in the green building over there" she proudly tells us "and this is what they make with it" she shows us several colourful screwtops for pet bottles. "Ushuaia is a good workplace, and many immigrants come here," we learn. The work is well paid, and Tierra del Fuego offers attractive social benefits, not to be obtained anywhere else in Argentina. "The shearing shed was last used in 1996, when an extremely cold winter killed 90% of the sheep. After that devastating winter, the descendants of Thomas Bridges decided to switch from sheep to tourists" Santiago, a tourism student from Buenos Aires, is showing us around the historic Estancia Harberton, the first ranch in Tierra del Fuego. 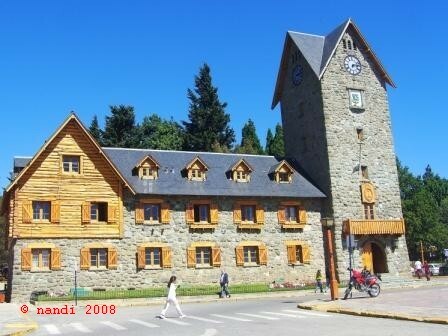 It was built in 1886 by the Anglican missionary Thomas Bridges, one of the founders of Ushuaia. When he moved to this uninhabited spot on the coast that he named after his wife’s home town in Devon, the family brought not only a complete wooden house over from England, but also several plant seeds, among them blue lupines. Not known in this part of the world before, their decorative inflorescences can be seen all over Tierra del Fuego today. From the sunny garden of the Estancia we enjoy a terrific view over the Beagle Channel to the Chilean island of Navarino and the small town of Puerto Williams. "Puerto Williams was an important military base in the 1970s when Chile and Argentina quarrelled over two islands in the Beagle Channel. For the same reason, the Argentinean government built the first road to Harberton, which until then could only be reached by boat," Santiago concludes. On our way back from the Estancia we pass several peat bogs. The crumbling brown earth cubes are drying in the sun on numerous wooden racks, somehow reminding us of the German artists’ colony of Worpswede. Margarita rummages through the minibus and finally comes up with a Tupper box full of a withered curly plant: "This decomposes into peat over the years," she explains, urging us to touch the dry leaves. After visiting two picturesque lakes and a famous bakery in, yes, an artists’ colony (where we have delicious churros, still warm and filled with caramel cream!! ), we stop at a small embankment. "Look how they are working! Normally they only work at night, you know." Margarita has led us to an active beaver colony where some huge, fat beavers are swimming busily around, building new dams. The beavers came as a gift from the Canadian government at the beginning of the 20th century and were meant to be the base for a lucrative fur industry. But due to the lack of predators on Tierra del Fuego and the abundance of food the beavers only got layers of fat instead of growing a thick, valuable fur. Today there are far too many of them, and we had already seen numerous abandoned beaver dams that had changed the landscape and destroyed large areas of forest. "Where the beavers are, you can’t drink the water," sighs Margarita "but they are fascinating, aren’t they?" Back in the minibus, she unwraps a bundle of kitchen towel to show us a beaver skull she has carefully glued together. To us it looks like a rat skull with ugly, very long front teeth. Although the sun doesn’t go down before 10:30 pm at this time of the year, it gets distinctively colder in the evening. It’s time for that red sweater again and we drive back to Ushuaia.